The town of Arromanches is situated at the location of Gold Beach, one of the beaches where British troops landed on D-Day. The Mulberry Harbor was built at Arromanches and was the inspiration of Sir Winston Churchill who knew that there needed to be a way for thousands of troops, supplies, and reinforcements to be delivered for the allied soldiers landing in Normandy. Winston Churchill had the foresight to recognize the need for the creation of an artificial harbor in Normandy. He knew that the thousands of troops landing on the beaches of France could only carry enough supplies (food, bullets, fuel, etc.) for a few days. Since the Allies were not planning to invade any of the major existing ports on the northern coast of France, the troops would suffer without reinforcement of supplies. In the days immediately following D-Day, the Allies sunk several old ships in order to form a breakwater. The cement blocks which had been towed across the Channel at 6 km/hour as the invasion began became the Mulberry Harbor and protected the landings of 2,5000,000 men and 500,000 vehicles. There were two Mulberry Harbors, Mulberry A and B. The one at Arromanches was Mulberry B. Mulberry A was located near Omaha Beach. 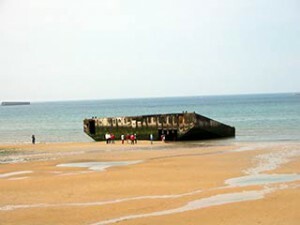 A storm two weeks after D-Day destroyed Mulberry A and damaged Mulberry B.
Click here to read about our Normandy Day Tour from Paris that visits Arromanches.